Although here in Ireland our climate is usually fairly mild, the wind and dampness causes a high level of heat loss from our buildings. A glance at the diagram on the right shows how much of the heat we pump into the buildings is lost. 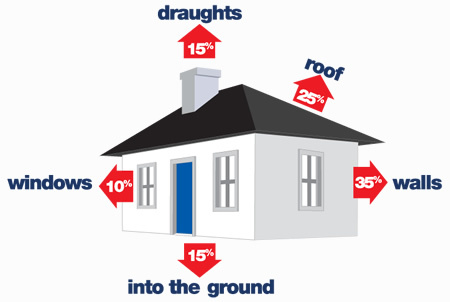 An uninsulated building is an enormous drain of heat, and the heating bills paid on it are essentially money down the drain. Insulation is something which any owner of a residential or commercial building cannot afford to ignore. Whether your motivations are saving the planet, or simply saving your pocket, there are many important benefits. From 1 January 2009, anyone selling or renting a property in Ireland must by law provide a building energy rating which must be carried out by an accredited Assessor. The assessment is a comprehensive assessment which takes into account the insulation properties of all the building elements, solar gains, ventilation losses, thermal bridging, heating system efficiency etc. Once carried out, the certificate you receive is valid for 10 years. 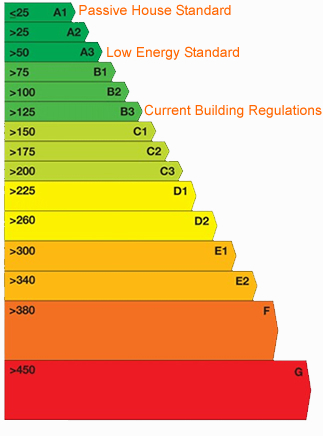 The rating scale is very much like that of domestic electrical goods, with A being a low or passive energy house, and G being an extremely energy-inefficient building. Evidence shows already that properties with good energy ratings are more desirable for both the sales and rental markets. At Ecowise we are qualified BER Assessors, although it is not the main focus of our business. We are happy to advise you and also to work with other BER Assessors.